Welcome to Appleseed, Massachusetts, where stories grow in soil, sentences are kept as pets, and pianos change your point of view. 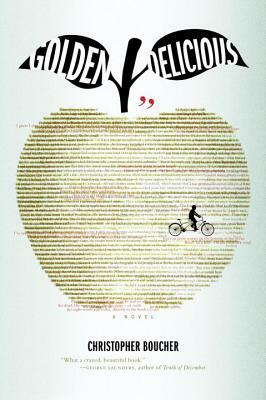 Golden Delicious chronicles the narrator's rich, vivid childhood - driving to the local flea market with his father, causing trouble at school, pedaling through the neighborhood on his Bicycle Built for Two. But as the local economy sours, the narrator's family is torn apart. His mother joins a flying militia known as The Mothers; his father takes an all-consuming job; his sister runs away for a better life elsewhere. Who will save Appleseed? Will it be the Memory of Johnny Appleseed? The Mothers? The narrator himself? Golden Delicious is the eagerly awaited follow-up to Christopher Boucher's acclaimed debut, How to Keep Your Volkswagen Alive. It's a tour-de-force unlike any other, that takes you to the heart of family, love and memory. CHRISTOPHER BOUCHER teaches writing and literature at Boston College, and is the managing editor of Post Road Magazine. He is the author of How to Keep Your Volkswagen Alive and lives with his wife and two children in Newton, MA.